The death toll after the devastating earthquake that struck Nepal last week, has reached at least 7,040, officials said. A spokesperson from the National Emergency Operations Centre confirmed the death toll on Sunday. The number of injured has climbed to 14,123, with 6,512 of theses currently being treated in hospital. 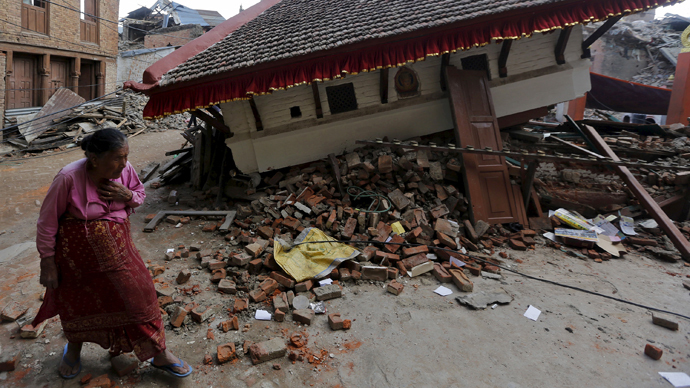 The death toll will be "much higher," warned Nepal’s Finance Minister Ram Sharan Mahat. "There are still villages where we know that all houses have been destroyed, but haven't yet been able to reach. The aftershocks have not receded and we expect the final casualty numbers to climb much higher,” he said. Earlier, Nepal police spokesman Kamal Singh Bam spoke of 7,056 dead and 14,227 injured. “We are continuing our search and rescue operations, “ Bam said on Saturday. Nepal's Home Ministry official Laxmi Dhakal added there is little hope of finding any more survivors: "Unless they were caught in an air pocket, there is not much possibility." About 100 people in neighboring India, China and Bangladesh were also victims of the quake. However, police and army managed to rescue several survivors almost eight days after the earthquake struck. At least three people were pulled from rubble in Sindhupalchowk district, northeast of the capital Kathmandu, a home ministry official said. Also a 101-year-old has been rescued from the rubble of his house after it collapsed, Arun Kumar Singh, a local police official told AFP. "He was brought to the district hospital in a helicopter. His condition is stable," Singh said. "He has injuries on his left ankle and hand. His family is with him." Rescuers have managed to pull out the bodies of 50 people from the area hit by a strong avalanche on Mount Everest. This includes several foreign trekkers. None of the corpses have been identified, Pravin Pokharel, deputy superintendent of police in the northern district of Rasuwa, said on Saturday. About 200 others, including villagers and trekkers, are still missing in the area, Uddhav Bhattarai, the senior bureaucrat in the district, told Reuters. "We had not been able to reach the area earlier because of rains and cloudy weather," he said. About 8 million people in Nepal (population of 28 million) have been affected, the UN said, adding that at least 2 million people still need tents, drinking water, food and medicine. Some 600,000 houses have been destroyed or damaged and survivors are afraid to go home, fearing aftershocks. "Hospitals are overflowing, water is scarce, bodies are still buried under the rubble and people are still sleeping in the open," Rownak Khan, UNICEF's deputy representative in Nepal, said in a statement, "This is a perfect breeding ground for diseases." UNICEF added that children may be most vulnerable in the quake aftermath. "With the monsoon season only a few weeks away, children will be at heightened risk of diseases like cholera and diarrhea infections, as well as being more vulnerable to the threat of landslides and floods," the UN body said. On Sunday, Nepalese authorities shut Tribhuwan International Airport, on the outskirts of Kathmandu, to large planes flying in relief supplies and aid workers, officials said. According to Birendra Shrestha, the airport manager, big jets are now banned due to runway deterioration. Medium and small-size planes are still being permitted to land.